MK Wellness is both honored and humbled by the opportunity to serve the Los Angeles residents and help them deal with everyday debilitating health issues. The primary focus of the dispensary is on providing nothing but the top-shelf medical marijuana, excellent customer service and sensitive and compassionate care. To implement its ideas, the dispensary collaborates with the most reputable cultivators in the industry who not just grow mmj flowers but also check every leaf for chemicals, pesticides and make sure every flower is potent enough. The well-trained and highly experienced staff of the dispensary is already happy to answers all inquiries regarding the types of strains, their properties and effects on the human body. 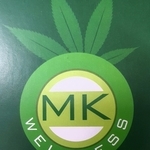 At MK Wellness everything possible is done to ensure the friendly and welcoming atmosphere: every patient is treated in a special way, with care and respect. In addition, all patients, both new and regular ones, are treated with special offers.